Share the post "40+ Foods to Try in Barcelona"
For me, one of the most rewarding things about traveling is trying out the local food in each place. I vigorously research before every trip I take, and a special portion of that is dedicated specifically to traditional foods in each city and at different times of the year. However, before moving to Barcelona, I didn’t really think to research food – I’d just survive on a diet of paella and sangria, right? No time to read it now? Click to pin for later! …Wrong! Over the last 4 years I have learned so much about food culture here, and none of it is what I expected (read about 10 Unexpected Things You’ll Learn as an Expat in Barcelona). Living with 5 different host families also gave me a unique perspective on this – for two years, I had to eat whatever was served or offered to me. What better way to get to know the true, local food of a city? Only for the True Adventurer! So choose according to your own personal tastes! The dishes I have compiled in this list aren’t strictly found in Barcelona, but are common to find throughout the city and Catalonia as a whole (perhaps some of them originated from other parts of Spain, or have even been adapted from other countries). I have listed each food in 3 languages (when possible) – first in Catalan, then in Spanish, and then in English with “quotations” because there just isn’t a correct English translation in some cases (if there are no translations in quotations, it’s because an English word for it just doesn’t exist). I’m putting the Catalan name first in respect of Catalonia’s desire for independence, and the fact that, if you’re going to a true, authentic restaurant in Barcelona, the menu will probably be in Catalan (some exceptions). For recommendations on finding authentic restaurants, visit my post Best Restaurants & Bars in Barcelona. For places to visit and insider tips to the city, visit my Ultimate Guide. These are fried potatoes topped with a spicy sauce and allioli (a garlicky mayonnaise, see below). When I came to live in Barcelona my first year, I was sure that I was going to lose weight eating a Mediterranean diet. What I didn’t know was that people here love fried foods, especially potatoes, just as much as Americans. You will find these in practically every bar and restaurant, but they are not all done the same. Sometimes they only come with one of the two sauces, and sometimes, in touristy/cheap places, it basically just comes with ketchup on top. Try to make sure you’re in an authentic restaurant/bar before ordering! Or check the reviews on Google. See my tips on choosing an authentic restaurant. These are small green peppers, carefully fried until the skin is blistering, then topped with salt. Another unhealthy starter, but quite delicious when done well! Sometimes they’re bitter, other times a bit spicy. But they’re addictive when paired with a beer or vermut (see drinks below)! This is one of my absolute favorite starters! It is basically french fries topped with 1 or 2 over-easy eggs, and sometimes (preferably) pernil iberic (see below) or chorizo. The runny yolk of the eggs mixed with the potato and high-quality ham is to die for! This is another dish that I only recommend ordering when in an authentic locals’ bar or restaurant, because I’ve had way too many disappointments with over-done eggs and gross, soggy fries. Doesn’t sound too exciting, but when done well, it is quite delicious! In fact, back in America, I never really liked scrambled eggs – but there’s something special about them here. Just like with the Ous Trencats (above), they pair eggs with some type of flavorful meat, such as ham, chorizo, etc. Except this time, the eggs are scrambled. I find the best ones to be those where the egg isn’t completely cooked, so it has a creamy texture. Sometimes they serve this over potatoes, other times with bread. I had an incredible one, served with bread, at Bar Bodega Quimet. For more information and an interactive map, read my article about the Best Restaurants and Bars in Barcelona. Another typical bar food that is generally pretty cheap is a Bomba. It is a fried ball stuffed with mashed potatoes and either shredded or ground meat and some spices, then topped with a creamy or sometimes spicy sauce. My husband and I love to cut straight into it and mix all of the deliciousness together, but you can also just take it bite by bite. It is generally enough to share as an appetizer between two to three people, depending on how hungry you are. 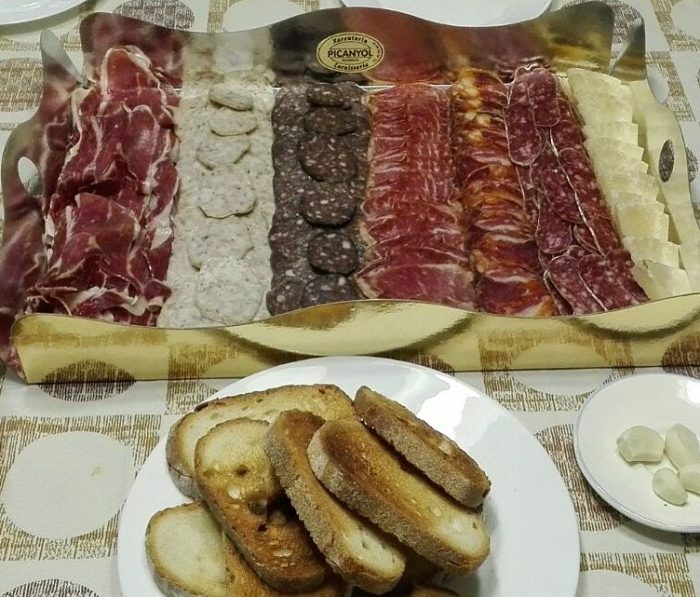 Catalans love their cold meats, and it is quite common to eat these alone, as an appetizer/snack, or even as a meal accompanied by Pa amb Tomàquet (see below). 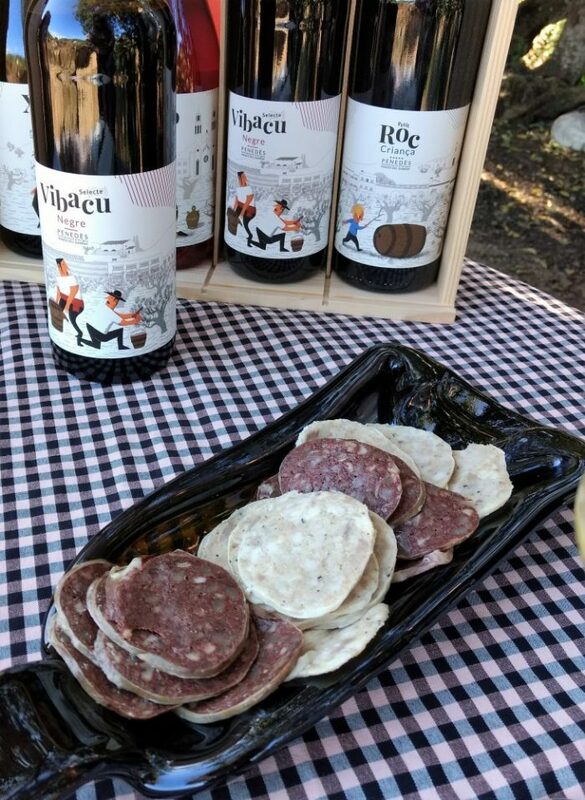 Fuet: A skinny, hard sausage made with cured pork and spices, such as pepper, garlic, etc. You can find different varieties and flavors, but the most common (and my personal favorite) is the original. It looks almost like salami, but it is thinner. My husband and I are addicted to this, and almost always have one at home to snack on! There is a white casing that you can either remove before eating or leave on (personal preference). Llonganissa – Longaniza: Looks very similar to fuet (above), but is generally a little bit thicker around. It also uses ground meat, generally pork, and adds some salt, pepper and sometimes other spices. I find that, in general, llonganissa is a bit stronger in flavor and more expensive at the market. For that reason, we don’t eat llonganissa as much, but it is one of our favorite foods! It also has a whitish casing like fuet, and although it is edible, I tend to prefer to remove it on llonganissa. Botifarra – Butifarra: A sausage made with pork and sometimes with spices and other foods like egg, rice, mushrooms, and cheese. The traditional one is quite plain or with garlic and oregano. It can be served hot or cold. The hot version is traditionally grilled or cooked in the oven and served with allioli (see below) and mongetes (white beans). It isn’t a particularly exciting dish, but when done well, it is tasty. The cold version is thinly sliced and served either alone or with Pa amb Tomàquet (see below). Pernil Iberic – Jamón Ibérico – “Iberian Ham”: Probably the most widely known Catalan/Spanish specialty behind paella, Iberian ham is an amazing (albeit expensive) food to try while in Barcelona! There are many different varieties, the main difference generally being what the pig was fed (acorn-fed pigs are the best) and how long the ham was cured for (minimum curing time is 1 year). It is made exclusively from black Iberian pigs. When you first see it, it can be a little bit of a shock. It is literally the entire leg of a pig, and you can see the hoof, skin, hair and all. The master carvers place the leg on a special mount and cut thin pieces directly from the leg, sometimes in front of you. I had a little bit of a problem with this at first, but the taste is hard to resist. I’m now addicted! It is very common for families to have a leg at home around Christmastime (my husband’s company, for example, gives each employee one every year). You will find this type of ham in many typical dishes, tapas and pinchos. To this day I don’t know why so many Catalans and Spaniards are so obsessed with this dish, but regardless, it is a local favorite. Cooked potatoes (and sometimes onion) are added to a pan with olive oil, then topped with many scrambled eggs. They allow the bottom portion to cook, then carefully flip the whole thing and put it back into the pan (with the help of a plate and some skill) to finish cooking. There is a common argument between locals about which type is better: with or without onions, fully cooked or slightly under-cooked (so the egg is a little runny). I personally love it with onions and under-cooked eggs! This dish can be eaten alone, or served in slices on top of bread. This is a Catalan comfort food! I remember my first time in Barcelona, we went to a crowded restaurant and asked them to bring us the most typical food they had. They brought us croquetes, but didn’t explain what it was. We tried them, but were not impressed – it was a gooey, creamy mixture inside a fried shell. It wasn’t bad, but we just didn’t understand the appeal. Four years later, and I now have an appreciation for it. Croquetes have a base of some type of meat or vegetable (generally chicken or ham), mixed with potatoes or a creamy sauce, then rolled in breadcrumbs and fried. I highly recommend the ham croquetes. Only order these in a good bar or restaurant, otherwise you’ll be highly disappointed! You can also find unique varieties of this with shrimp, asparagus, mushroom, etc. You’ve probably heard of allioli before, or even had it as a dressing for a sandwich. But this is not the same allioli. The name for this comes from three Catalan words: All (garlic), i (and) & oli (oil). 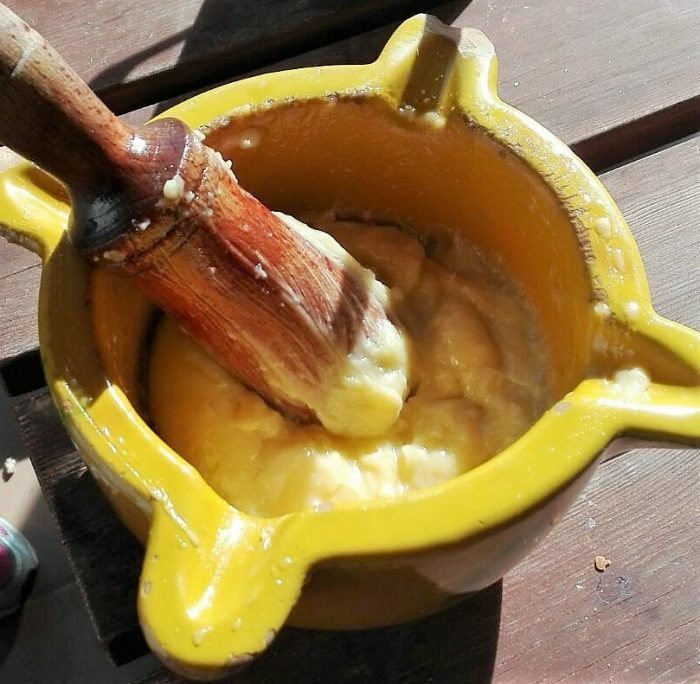 The traditional allioli only has those 2 ingredients, but more commonly nowadays it is also made with egg yolk and salt. It is basically a garlicky mayonnaise, and some people prefer it spicier than others (more or less garlic). 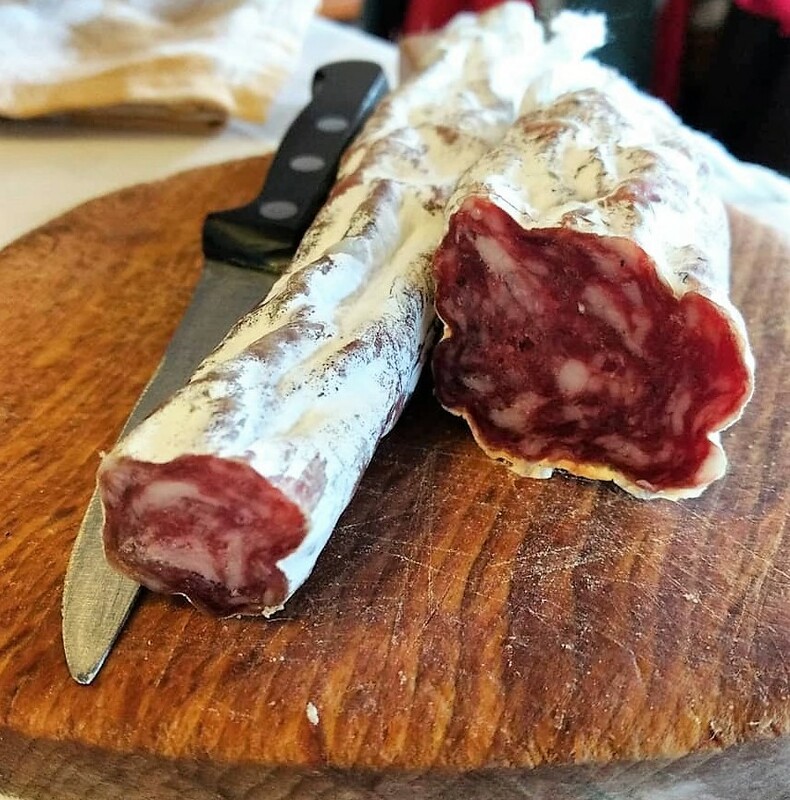 It is a Catalan staple, and is generally served with pa amb tomàquet (below) or meats, such as butifarra (above). It is an absolute requirement at barbecues! My husband even jokes that the only two things you need at a barbecue are allioli and good bread (who needs meat when you have that?). The traditional type is made by hand using a mortar and pestle, and can be quite difficult and tiring to make (think – 20 minutes or more mixing carefully). But it is so rewarding once you finish! Doesn’t sound too exciting, does it? But Catalans are obsessed with it! They claim to have the best tomatoes for this, which are small and super juicy. They generally take toasted bread, scrape it with a raw garlic clove, cut one of the tomatoes in half and spread it’s juices across the surface, then top it with high-quality olive oil and salt. They either eat this alone or topped with cheese or embutits (see above). I still don’t understand why it is so popular, but it is tasty nonetheless. Also, if you order a sandwich while in Barcelona, 99% of the time they’ll serve it to you with bread done in this style (so if you don’t like tomato or garlic, be sure to request it without!). A vegetarian delight! This is a mix of roasted vegetables, generally eggplant and bell peppers. It is topped with olive oil and sometimes garlic. It can be made over a fire (the traditional way) or in the oven. It can be served both hot and cold. Want to try making it home? Check out this great recipe. This is the last thing I expected to find when I came to Barcelona, but nonetheless, it is a local favorite. It is traditionally made at home the day after Christmas, using the leftover meat from the feast the day before. 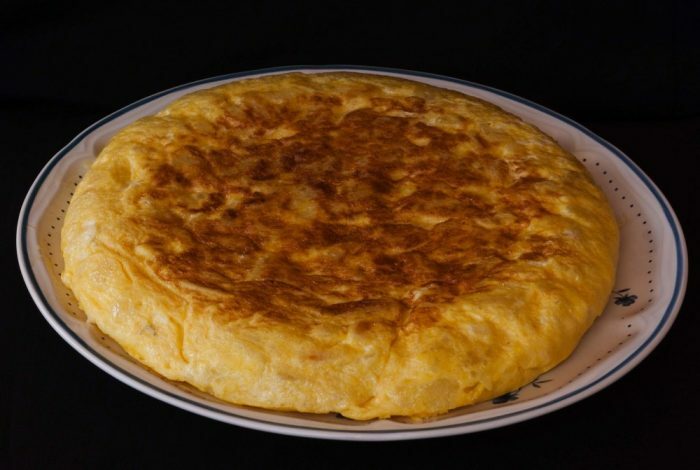 But you can also find it in almost every authentic restaurant, and it is a favorite for Catalan children. It is basically noodle rolls stuffed with stewed meat and topped with a creamy white sauce and cheese. Can’t really go wrong with that, now can you? I think this one is quite obvious, but it is worth noting that there are different types of paella. 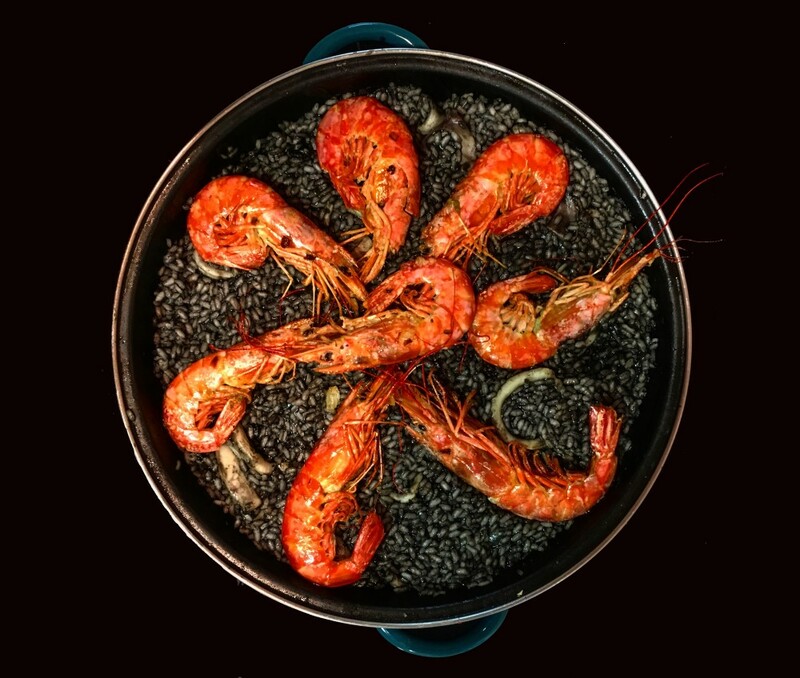 The original paella originates from Valencia (~3 hours South), not Barcelona, and consists of meat, not seafood. However, the most common one you’ll find around Barcelona is the seafood version. If you see “mixta” on the menu, it means it will be a mix of both meat and seafood. The meat version generally comes with chicken, rabbit, various types of white beans (not quite what you’d expect, is it?) and, of course, rice. The seafood version (sometimes called Paella Marinera) generally has shrimp, squid, mussels and clams along with rice. The yellowish color the rice has comes from the saffron, an expensive spice. However, if you go to a restaurant and see that the paella is super yellow, run away! Saffron doesn’t give that intense yellow color, and the touristy places use a less-expensive substitute. You can also find other twists on the typical paella, like the one pictured on the right. This one had eel and duck as the main meats. This dish is super similar to Paella, but using noodles instead of rice. It is generally served with allioli (see above), which mixes with the noodles and spices giving a lovely, creamy texture. It is delicious! If you want to try making it at home, check out this great recipe. In my opinion, this is one of the most unique and fun Catalan traditions there is! I always look forward to January because it means it is Calçot season! Calçots are basically giant green onions. Doesn’t sound super interesting, does it? But I assure you, it is worth trying! The onions are grilled over an open flame until they are completely blackened on the outside. To eat, you peel off the blackened outer layer with your hands (restaurants generally provide you with gloves and a bib so you don’t get too dirty) so that you’re left with the clean inner part. You dip this into the typical salsa de Calçots, made from tomato, almonds, garlic, olive oil, and various spices (find a great recipe here). Once you have your onion covered in the sauce, it is time to hold the Calçot above your head and bite into it! If you try this at a restaurant, it is generally served as the first course, and then they bring you grilled meats for the second course. Wash it all down with some sangria or good, red wine! 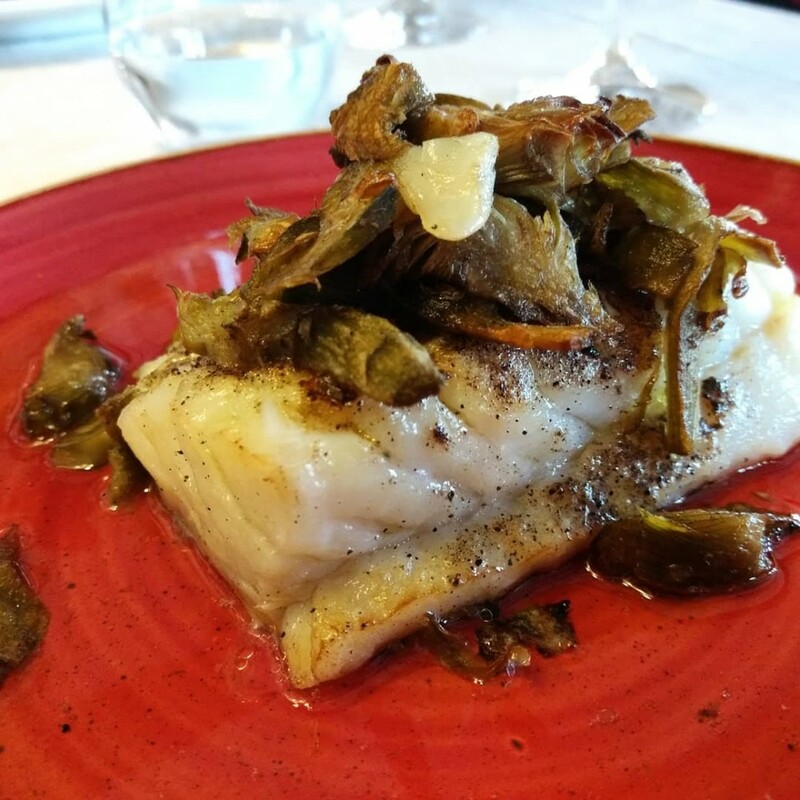 Cod topped with crispy artichokes. 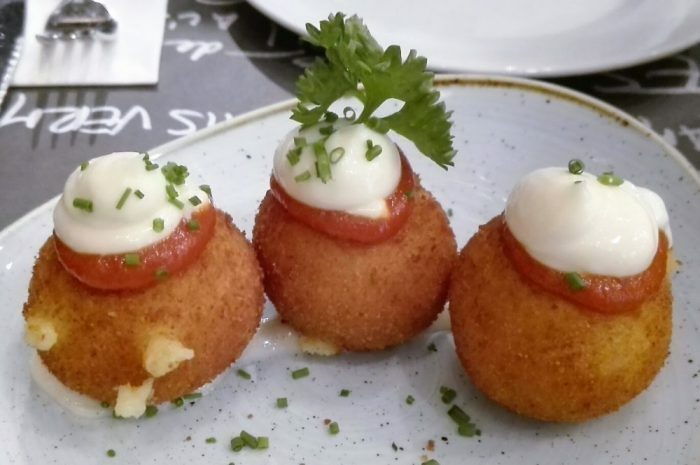 Catalans are obsessed with Bacallà, and almost every authentic restaurant you find in Barcelona will have at least one dish with Bacallà as the star ingredient. There are tons of different variations, from freshly caught, to canned, to salted and raw. I was surprised by just how popular this fish is, because in California (where I’m from), it always seemed to be a lower-quality, cheap fish to buy. But don’t let that fool you – Bacallà is absolutely delicious in Barcelona! Below I have listed some of the most common dishes you will find, but it is by no means a complete list. Bacallà amb Samfaina – Bacalao con Pisto – “Cod with Ratatouille”: Fried cod topped with a mix of vegetables (bell pepper, onion, sometimes eggplant) in a delectable tomato sauce. This is one of my absolute favorite Catalan dishes! They used to serve this at the school I was working at once a month, and I always looked forward to it. If a public school can make this well, it is difficult to mess up. For an authentic recipe, visit this website (It is in Catalan, but you can use a translator). Esqueixada de Bacallà – Esqueixada de Bacalao – “Cod Ceviche”: This is a dish similar to ceviche, where they use raw, salted codfish and mix it with a variety of peppers, tomatoes, onions, and spices. A rich, meat stew made with beef and a thick sauce of mushroom, tomato, onion, garlic, and white wine. It is generally served as a second dish with bread, to soak up all of the amazing sauce. I’m sure this doesn’t really need an explanation, but perhaps you’d be interested to know that this famous Spanish drink isn’t actually very common for locals! Sure, you can find it in many bars and restaurants, but that’s because of the demand by tourists. However, you can’t leave Barcelona without trying one! 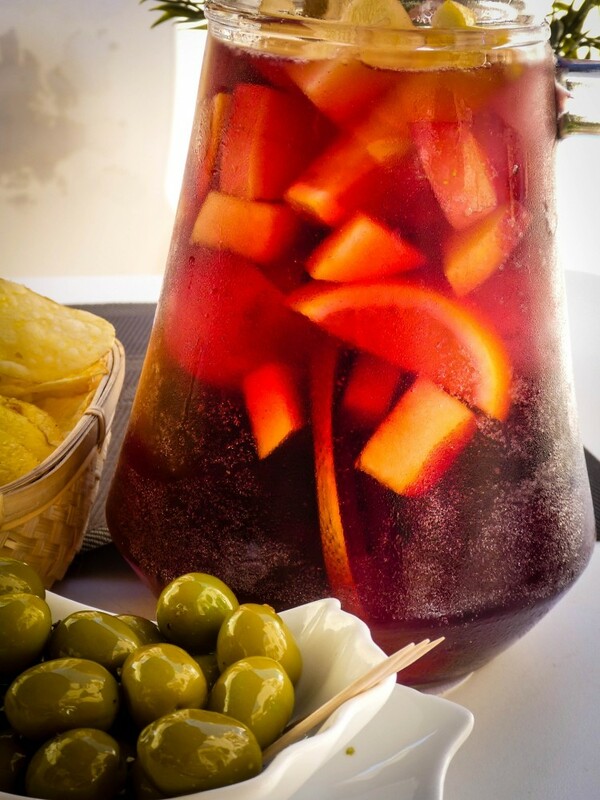 The main types of Sangria found in Barcelona are of red wine or cava (sparkling wine). It is basically wine left to sit with juice, fruit, spices, and sometimes even brandy. I recommend trying this at a true Catalan place, the touristy cafes and restaurants serve up a sickeningly sweet version. Catalans love their cava! It is sparkling wine, and they are very proud of it. Some of the best cavas come from the wine region called Penedes, just south of Barcelona. I highly recommend visiting some of the wineries there if you’re given the chance! Just keep in mind that you have to reserve visits in advance. 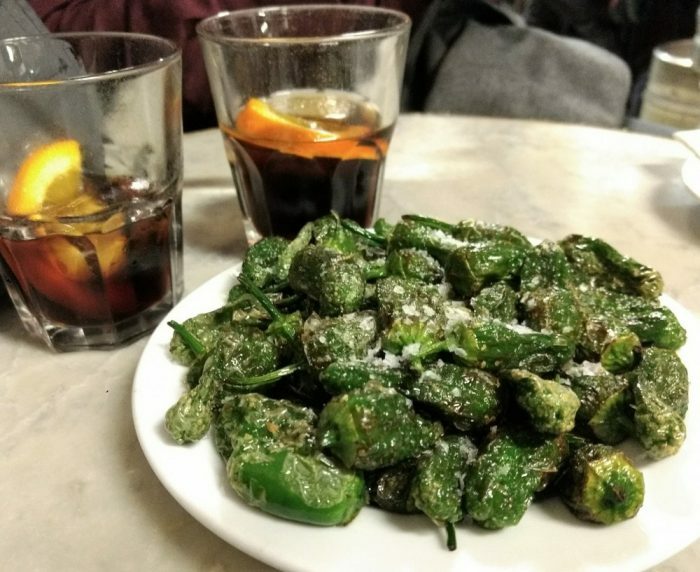 On the weekends, Catalans love to go and “fer el vermut” which means to go to a bar or restaurant with friends, have some light snacks (think – olives, sardines, chips, etc) and drink the delicious beverage called vermut. There are red and white varieties, but I personally prefer the red. It is basically a sweet wine infused with spices. It generally has a bit of a higher alcohol content than wine, so be careful! It is easy to drink these, they’re super refreshing. Sometimes they also offer you soda water to add a bit of carbonation and lighten the vermut a bit, but I love it plain. It is often served with an orange slice and olives in the drink itself. To learn more about the history of this beverage, click here. This dessert is very similar (if not the same) as Crème Brûlée (but don’t tell Catalans that, they’re super proud of it and insist it is Catalan and not French – I once got in an argument over this!). There are slight differences between the French and Catalan version, but it is basically a custard dish topped with a crispy layer of caramelized sugar. For a great recipe, go here. 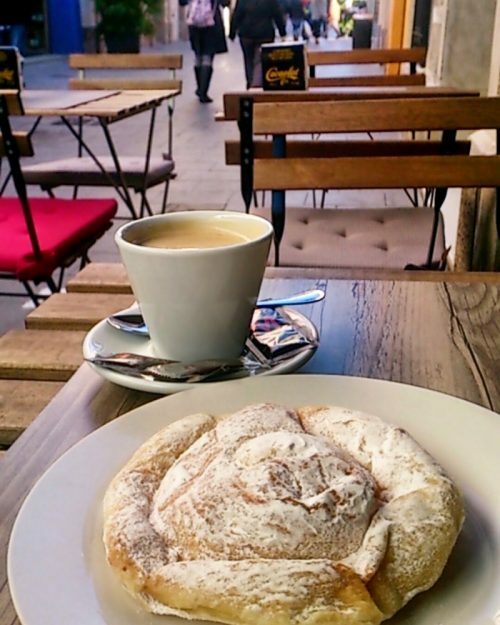 Originally from the island of Majorca, these are spiral-shaped pastries topped with powdered sugar. Very simple, but delicious as an afternoon snack or for breakfast with a café con leche! If you want to try and make this at home, visit this recipe. This traditional Catalan dessert can be found in many restaurants, but I highly recommend trying it at Montserrat if you can! Near the main tourist area of Montserrat you will find a lot of local farmers selling their products, including this famous dessert. It is a fresh cheese of either cow or goats’ milk topped with honey. It isn’t a complicated dish, but the sweetness of the honey and texture of the cheese goes together perfectly! 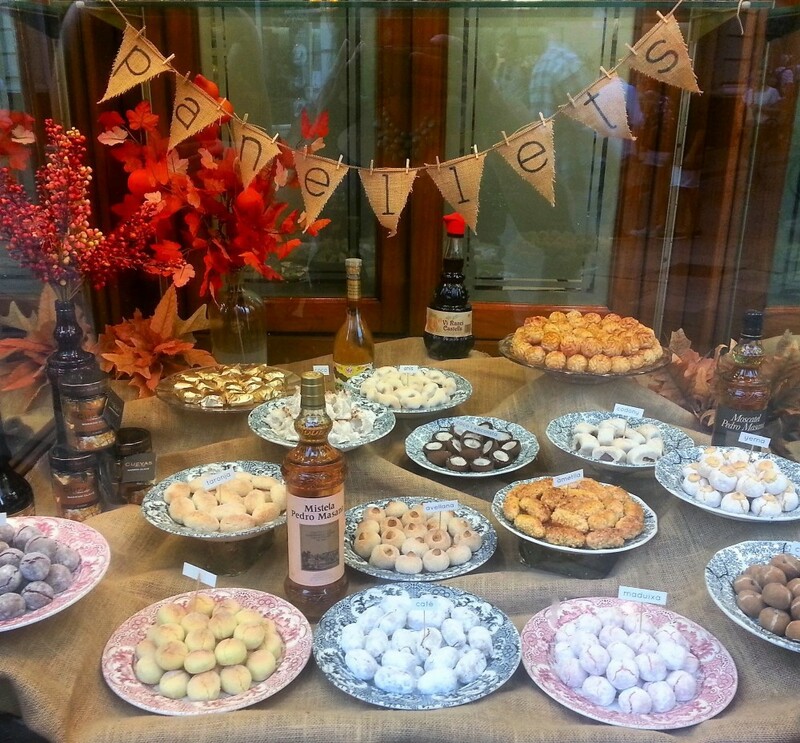 These are traditional little sweets served around All Saints Day. The traditional ones are made from a dough of sweet potato, sugar, and almonds, then coated with pine nuts or chopped almonds. There are also many other varieties nowadays where they add shredded coconut, chocolate, etc. They are quite yummy, and pair well with a glass of cava (see above)! If you want to try and make this for yourself, check out this recipe. 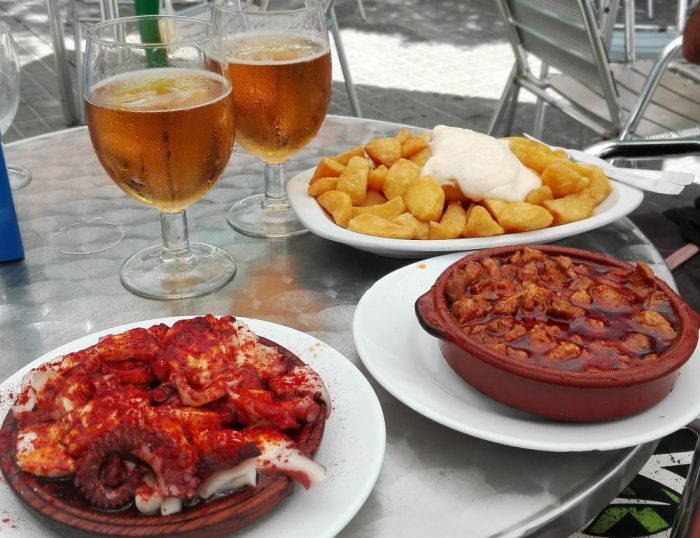 Pop a la Gallega – Pulpo a la Gallega – “Galician Octopus”: Slices of octopus served over potato, sometimes also in slices or mashed, and topped with olive oil and paprika. 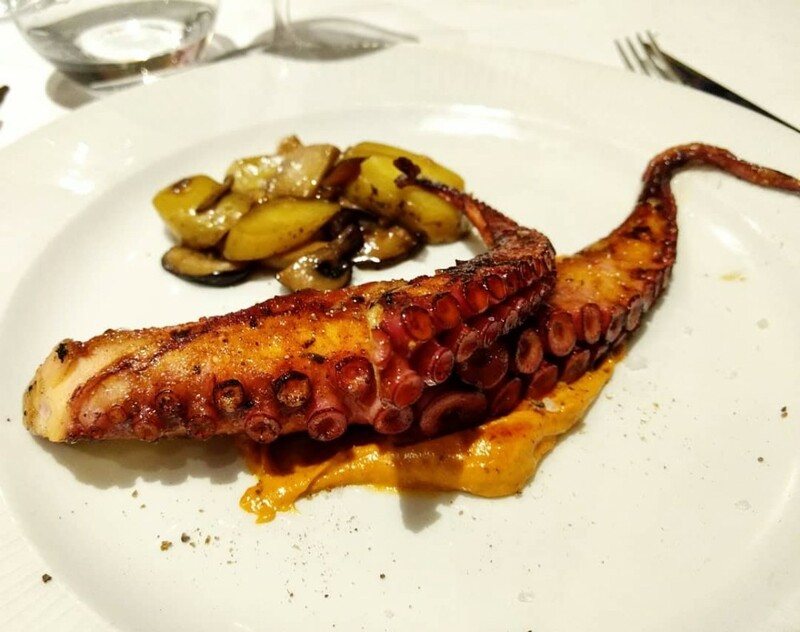 Pop a la Graella – Pulpo a la Parrilla – “Octopus on the Grill”: The entire tentacle, grilled to perfection and topped with extra virgin olive oil and salt. Pork isn’t anything new to most, but have you ever tried pork cheek? It is generally served bone-in, sometimes simply grilled and others topped with a delectable sauce. The meat itself is extremely tender and delicious. I must admit, I was super unsure of trying this, and the first couple times I did, I had a difficult time (my imagination gets the best of me). But it’s worth a try, and super tender. If you like paella, you’ll like this. So why did I put it under “picky eaters beware”? This black rice gets its color from squid ink. Although the flavor isn’t strong at all, something about eating an inky black spoonful of rice gave me the jitters for quite awhile. I still won’t order it for myself, but it can be fun to try. But be sure to go to the restroom directly after, preferably with a toothbrush – the black tends to stick to your teeth! A black sausage made with pig’s blood, and generally with rice, onion, and sometimes nuts or breadcrumbs. This took me awhile to try confidently, and awhile longer to actually enjoy. Now I love it! In some cultures, this type of sausage is quite common and so perhaps isn’t seen as strange, but at least for Americans this is a little out of the comfort zone. Catalans love to grill morcilla at barbecues. Chipirones are a common ingredient you’ll find in many restaurants across Spain, and they can be cooked in a variety of ways. The most common way you will probably find in bars is the deep fried version, which is similar to fried calamari back home, just with more tentacles. It is generally served with lemon wedges, and can be quite delicious. But be careful, “chipirones en su tinta” (baby squid in their ink) will gave you a much different result, although it can be interesting to try. So this isn’t super unheard of, but as an American, I only recently started really eating and enjoying this (more than a year after moving here). But Catalans really know how to serve duck well, and many of the nicer restaurants will flaunt their delicious duck dishes. You can also sometimes find duck in the meat paella! I have to admit… I haven’t actually tried this yet. I don’t personally know anyone who orders it, and I’ve never been brave enough to order it for myself. But you’ll find this as a special in many restaurants, and according to the all-knowing internet, it is quite tasty. If you want to learn more about this dish, or even make it for yourself, check out this recipe. This is a liqueur made with a mix of fruit, nuts, and spices. It is quite strong tasting, but there are many varieties with varying ingredients, with some being a bit milder and others with more of a punch. It is generally served after dinner or with dessert. To learn more about its origins, go here. Doesn’t sound very appetizing, does it? But Catalans really don’t let any part of the pig go to waste! In the supermarket, you’ll find pig ear, snout, etc… I personally don’t care for this (I’ve tried it twice now), but there are people here who absolutely adore this dish. The texture is very different from any other meat you’ll try. Let me know what you think if you’re brave enough to try it! Snails can be found in many places across Europe, but Catalans sure do love it. I had tried snails once before living here, perhaps in France, and they were smothered in a delicious garlic butter sauce. I actually liked it until I took a moment to look at the slug and lost my appetite. But if you’re adventurous, give it a try here! It is definitely a specialty, and is generally served with a delectable sauce of olive oil, garlic, and parsley drizzled over them after they’ve been cooked either in the oven or over an open flame. This definitely isn’t limited to Barcelona or even Spain, but it was the first I had ever heard of it. My second host family brought it home because they knew I liked to try new things. I don’t know, but everything in my American being says that eating raw meat isn’t safe (my Catalan friends still make fun of me for that). I did try it, even got a few bites in, but something about the texture and my uneasiness wouldn’t let me eat anymore. However, if you don’t mind raw meat, give this a try in a nice restaurant and you’re sure to enjoy it! 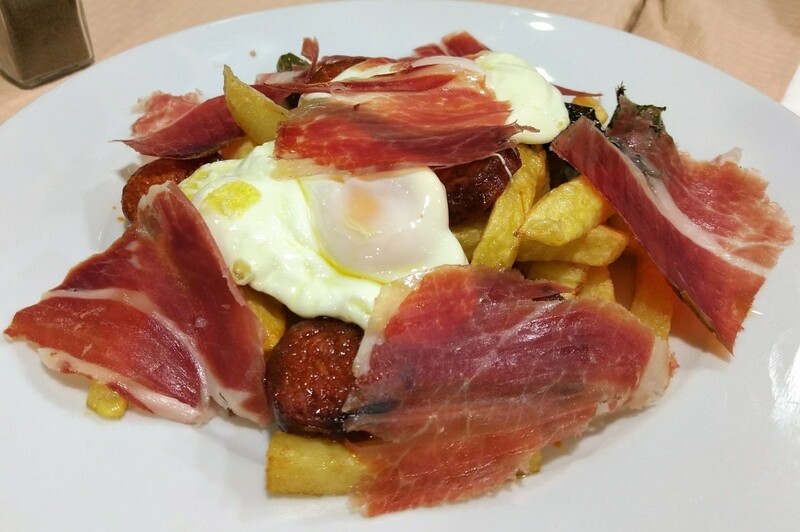 This dish, traditional of Madrid, is supposedly really good. However, I wouldn’t know, because I’m too big a baby to try it (although I’ve tried cow stomach in the past in Vietnamese and Mexican dishes, I just don’t wish to repeat). Callos is a stew made from tripe, garbanzo beans, sausage, and bell peppers. This is a common tapa served throughout Spain, but I’m not a fan. It is simply fried snout topped with salt. People rave about this, but I just can’t bring myself to enjoy it. If you look closely, you can see the pores of the skin, sometimes even a little bit of hair, and the shape in some pieces gives it away. But hey, good to try new things, eh? Have you tried any of these dishes in Spain? What was your favorite? Let me know in the comments below! Wow! That is quite a variety of colorful foods! I’m such a picky eater — I would not have done well with your host families. You have had quite the foodie adventure! My favorite would be the noodle dish! Oh boy, I shouldn’t have seen this with an empty stomach! Hahaha, that’s exactly how I felt writing it! Constantly wanted to go and get myself one of these. And ooh, those are pretty much my favorite guilty pleasure! Do you prefer them with jamon or chorizo? Thanks for reading! All those dishes bring back memories of the couple of months I spent in Palamos in Costa Brava. 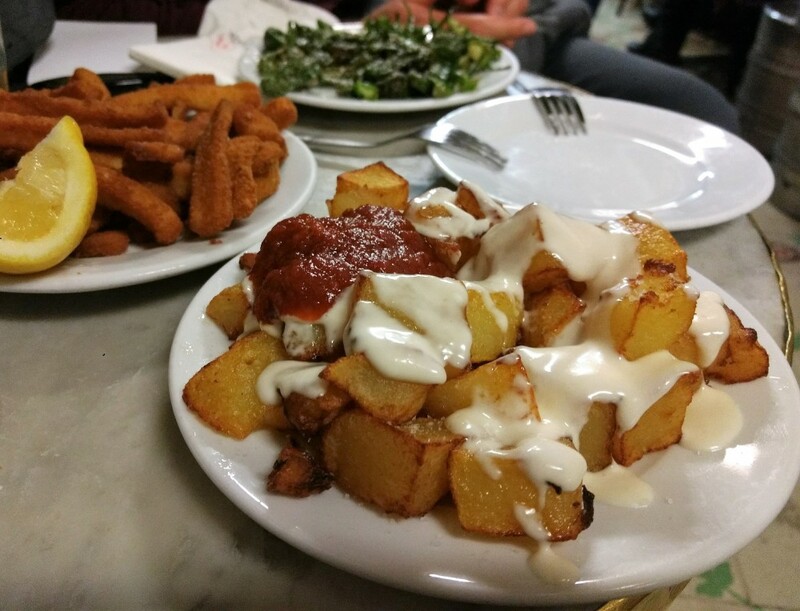 The tapas restaurants were my favourite haunts and patatas bravas, tortilla, and more were always on my table. I did not see a lot of octopus here (more of it in La Coruna) but I did have a lot of Gambas al Ajillo (garlic shrimp). Everything looks so good! I have tried a lot of the foods you mentioned but there are some I still need to try. I think the broken eggs is on the top of my list. Thanks for sharing on #TheWeeklyPostcard. I guess I tried almost everything, aside from Cow Stomach, Fried Pig’s Snout and Pig’s Foot! I mostly follow Vegetarian diet ,so even “Embutidos” is not my thing…lol I normally avoid meat whenever I have a choice. But with all my Spanish family I just can´t say no to a seafood paella on weekends. By the way, another foods popular here in Valencia are Arroz a banda and Carajillo de ron. The rest are very similar to those in Catalonia and Barcelona. I could read about Spain and its cuisine all day. We can’t wait to go there. Also, oxtail is incredible- you should really try it soon! Also excited to try the Spanish take on menudo/tripe. Cow stomach is actually one of my favorites, but my partner isn’t so keen on it. Thanks for sharing on #TheWeeklyPostcard! Do you have a trip planned? 🙂 And I definitely suppose I should try it! Perhaps the next time I see it, I’ll order it. And wow really? What dish do you like having tripe in? Thanks for reading!